The Theft of Fair Trade: A Producer’s Perspective | Small Farmers. Big Change. When TransFair/Fair Trade USA chose to disregard the wishes of Fair Trade producers, Alternative Trade Organizations, activists, and other long-time actors in the Fair Trade movement and leave the international system to create their own “Fair Trade” certification system which includes plantation coffee and cacao, justifiably they angered many Fair Traders. On the surface, it’s hard to argue with an initiative entitled, Fair Trade For All. I mean who doesn’t want producer empowerment for all farmers everywhere? The trouble is that once you go beyond the catchy name, you quickly bump into two stark realities. 1) Despite their claim that this initiative will benefit farm workers and small producers, Fair Trade is a model which works for those who own and run their businesses. In the case of small farmers, fair trade builds support for co-operatives and other associations. If you add plantations into the Fair Trade system, the benefits of the model will go to plantation owners, not the farm workers who toil in the fields and groves. So it is important to compare small farmer co-operatives (where the farmers collectively own and run their business) with plantation owners (where one person, or a corporation) owns the business. Historically, Fair Trade was created in recognition of the fact that plantation owners already receive tremendous support from government subsidies, agriculture policies, international trade agreements, bank credits, and programs which provide technical assistance and field trainings. Small farmer organizations, on the other hand, are at a complete market disadvantage in almost every respect. They have never been able to compete in the same market because the playing field has never been level. 2) With their new initiative, Fair Trade for All, TransFair/Fair Trade USA has proclaimed that plantations and small farmer co-operatives can co-exist happily, peacefully, and productively in the same system. What’s all the fuss about? It sounds nice, and if it were so, there would absolutely be no protest. The tragedy is that it has taken 25 years of blood, sweat, risk-taking, mistakes, and losses to build a healthy supply chain for small farmer co-ops. Finally we can say that small farmers have a voice and a seat at the table, have some degree of economic and political power none of which came magically or overnight. But, our work is not finished; there is still so much more to be done. Give a plantation owner additional benefits, beyond those already afforded, and you will wipe out the advances small farmers (and other Fair Traders) have worked so hard to achieve. TransFair/Fair Trade USA walking away with the fruits of 25 years of the movement's collective labor. Finally, a philosophical question: If Fair Trade was created to balance an unfair playing field for small farmer organizations, and Fair Traders (producers, traders, and activists) who built the system and named it Fair Trade have always been strongly against plantations in coffee and cacao, what do you think about an organization that steals the name Fair Trade, walks away from the international Fair Trade system, and creates a new certification system in which coffee and cacao plantations will sit side by side with small farmer organizations? Is that not theft? “Since the 1990s, Fair Trade has supported the reactivation of co-operatives and small producer organizations. Fair Trade gives us an advantage. It allows us to become more competitive: coffee sales have grown; our product supply has diversified; we have broadened the market; and our sources of financing have increased. Fair Trade has been made up of small, organized producers. The first phase of Fair Trade was marked by solidarity and the social commitment of the consumers: “These are small, organized producers that should be supported.” Quality defined the second phase: the organizations became more professional and their supply was characterized by superior quality. Fair Trade was economically viable, socially responsible and environmentally sustainable. There are many examples in Peru: Cepicafe, Cocla, La Florida, Ceovasa, etc., all of which became political actors that continue to play an important role in the economy. Fair Trade has allowed us to become visible and it has given us the ability to influence political decisions at different levels of political power, guiding the role of international co-operation. 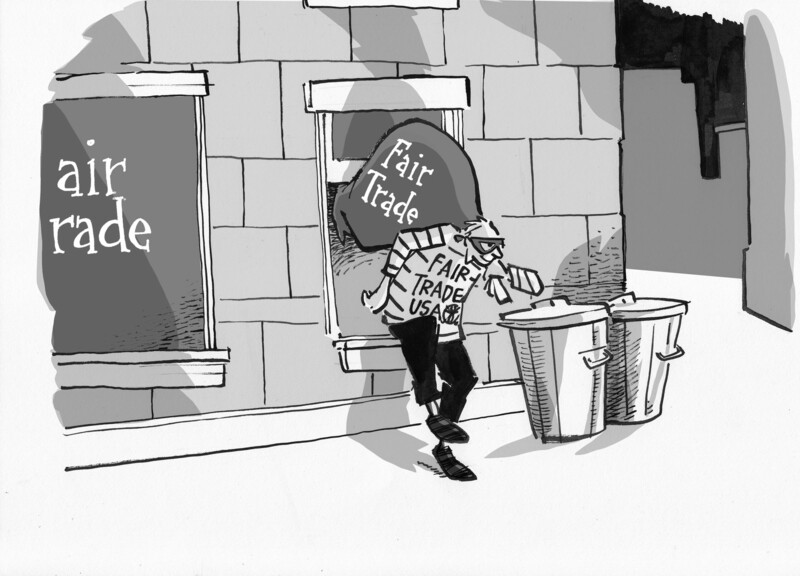 Fair Trade is about balancing unequal competition. 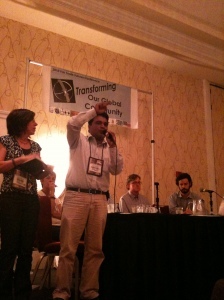 The decision of Fair Trade USA to include plantations in the system is a serious threat to small farmer organizations. The small producers cannot compete with the plantations and large companies that have taken control of the market and of the decisions being made by Fair Trade USA. Fair Trade, in Fair Trade USA’s scheme, doesn’t mean anything. In order to increase the market share there are large and small players in the system; organized producers and those who are not organized; good products and bad products. What is the message that we are going to send to consumers? How are they going to identify us? In wanting to make everything Fair Trade, we are left with no message. Fair Trade means nothing. … What is clear and seems to be difficult to understand in the North is that a producer organization can never compete with a large plantation. A co-operative is much more than a company that buys and sells coffee; it is a mechanism for development, practicing a solidarity economy by which the producers also hope to resolve their problems, such as a lack of highways and the need for healthcare centers and schools. From my point of view, Fair Trade cannot stop generating development, this must be emphasized. This was Fair Trade’s originating ideal and it should not be abandoned. Fair Trade is help for self-help: it helps to strengthen your organization so that you can use this to resolve your problems. Fair Trade USA has taken the wrong path—rather than continuing to fight so that Fair Trade can be more alternative trade, it is moving very close to traditional trade; it is playing by the same market rules which it aimed to change and is endorsing these same practices. So, what do you think? Are we going to allow TransFair/Fair Trade USA to make away with all we have collectively built and set small farmers back 25 years? Click here to add your name to the growing list of people who support Authentic Small Farmer Fair Trade. Has anyone trademarked the name “Fair Trade”? Just a question that arose in my mind when in the above article it was mentioned that TransFair stole the name Fair Trade and is using it to dilute its meaning. Really a great post. I think you’ve presented the argument in a very concise way, and the contribution from Santiago is powerful. Following your logic, I think no matter how you look at it – from an historical perspective, or a current one – Fair Trade USA is on the wrong path. Fair Trade was meant to change the way that we trade, not make it just a little better. So the question is, what now? It seems to me like the brand ‘Fair Trade’ is lost and gone forever. Does Equal Exchange think it is possible to resuscitate it? This is a very well written article! I understand the situation 100%, but I could use any suggestions that you may have on how to explain it to consumers when I am doing the EE Demos in Cleveland. It is a very difficult situation to explain the the every day shopper in the grocery store. Rita, the average shopper might understand that it’s just another example of giant corporations growing mediocre coffee and crushing the little guy, the small farmer growing premium coffee. It takes courage to innovate, and I think Fair Trade USA has done an excellent job and sticking with their beliefs in order to expand the impact of Fair Trade. This article reflects poorly on Equal Exchange, and I am disappointed that you would use such outlandish, sensational statements to criticize and organization that could potentially be one of your strongest allies. I have taken the time to understand why Fair Trade USA has decided to start pilot programs with farm workers, and at the same time they are increasing their support for cooperatives. If only you could use the energy it took to write posts like this to educate and enroll more consumers in the Fair Trade movement. Or, it you want to go the activist approach, target organizations that are creating the problems, not the ones trying to help. This just turns people off. Shame on you. I think the simple answer is that there is no seal people can trust to find a small farmer coffee. Standards have been weakening over a long period of time and now the main U.S. certifier for Fair Trade is certifying both plantations and small-farmers with no way for consumers to distinguish what they are buying. Equal Exchange has been, and will continue to be, committed 100% to small farmer co-operative groups where true change in international trade is happening.